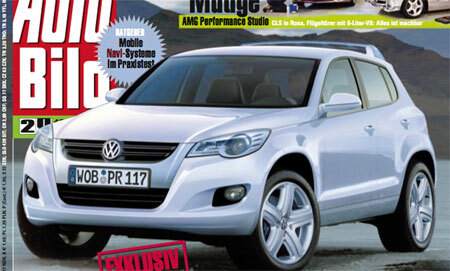 AutoBild has an artist’s impression of the Volkswagen Tiguan compact SUV, expected to arrive as a 2008 model. The compact SUV is based on the Volkswagen Concept A shown in February this year, and will be based on the Volkswagen Golf platform. The compact SUV’s name was chosen in a somewhat democratic fashion, with over 350,000 European car enthusiasts voting from choices like Nanuk, Namib, Rockton, and Samun. The name Tiguan won the poll, and a good thing too as the name starts with a T, something in common with it’s older brother Touareg. The 2008 Volkswagen Tiguan will be priced to compete against the Toyota RAV4 and the Honda CR-V.
I’ll have one with a 3.6 litre R36 engine please. Thanks!